Part 1 Fundamental principles of interior textiles: Natural fibres for interior textiles; Synthetic fibres for interior textiles; The use of knitted, woven and nonwoven fabrics in interior textiles; Surface design of fabrics for interior textiles; The use of textiles in carpets and floor coverings. Part 2 Developments in interior textiles: Advances in joining fabrics for the furniture industry; Environmental issues in interior textiles; The role of textiles in indoor environmental pollution: problems and solutions; Developments in flame retardants for interior materials and textiles; Fire testing of upholstered furniture, current and future methods; Innovative textiles for seating. 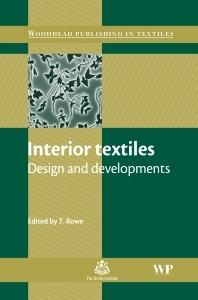 This book provides an overview of the types of textiles used within the interior textile sector and key technological developments and safety issues affecting the industry. An understanding of these topics enables the designer or manufacturer to select the most appropriate fabrics for interior applications. The first group of chapters reviews types and selection of materials for interior textiles, including natural and synthetic fibres as well as knitted, woven and nonwoven fabrics. Further chapters review surface design of interior textiles and the use of textiles in carpets and floor coverings. The second part of the book discuses developments in such areas as joining furniture fabrics, the use of sustainable and recycled textiles in interior applications, using interior textiles to minimise indoor environmental pollution, flame retardant materials and innovative textiles for seating. Trevor Rowe is a Senior Lecturer in the School of the Built Environment and Engineering at the University of Bolton, UK.